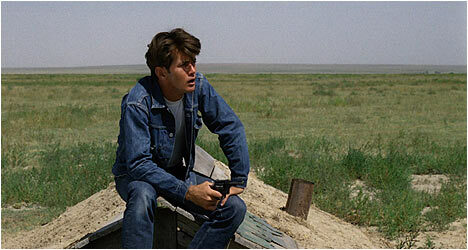 Badlands (1973) was an auspicious debut from Terrence Malick. Based loosely on the real-life killing spree of Charles Starkweather and his girlfriend Caril Ann Fugate in 1958, Malick made his film independently and for little money. The end result is a doomed lovers on the run road movie that juxtaposes the almost fairy tale voiceover narration by Holly (Spacek) with the sociopathic actions of her boyfriend Kit (Sheen). The film would also demonstrate Malick’s uncanny ability to capture the beauty of rural landscapes and contrast them with the violent impulses of its protagonist. Kit works as a trashman in a sleepy small-town in South Dakota. One day, after work he meets Holly on the front lawn of her house. It is one of the more unusual courtships as we don’t see too many displays of affection between them or declarations of love, but mostly because Holly tells us so in her narration. They gradually fall in love much to the chagrin of her strict father (Oates) who doesn’t approve of Kit. After the two men have a confrontation, Kit and Holly go on the run. Martin Sheen and Sissy Spacek, early on in their respective careers, deliver impressive performances. On the surface, Kit seems like a nice enough guy, but Sheen is able to turn this off on a dime to show the dispassionate killer that lurks under the James Dean good looks. It would be easy to dislike Kit, based on all the bad things he does, but it is Sheen’s natural charisma that makes the character so interesting to watch. Initially, Spacek plays Holly as something of an innocent, but she explains in her voiceovers that she had plenty of opportunities to leave or turn Kit in. There is a certain naiveté about Holly and she sees the older Kit as someone wiser in the ways of the world then herself. Kit and Holly’s escape into the wilderness would mark the beginning of Malick’s preoccupation with nature. He is fascinated by the beauty of it and the wonder it represents, often juxtaposing the environment with the ugliness of human nature as he does in Badlands with Kit’s casual disregard for human life. Malick manages to de-glamorize what could have been a lurid tale by showing Kit and Holly enduring significant stretches of doing every day things or nothing at all. It is like the moments of violence punctuate the otherwise banality of their lives. Malick does a nice job of making the most of his meager budget, filming on location to give Badlands a more expansive feel. Badlands has become an influential film, inspiring countless like-minded efforts. It would also foreshadow Malick’s subsequent film Days of Heaven (1978), which examines forbidden love with a rural landscape as its backdrop. It was an excellent start to an illustrious career of one of the most unique filmmakers to come out of America. “Making Badlands” is a 42-minute retrospective documentary featuring actors Martin Sheen and Sissy Spacek and production designer Jack Fisk. All three share their initial impressions of Malick. Sheen and Spacek spent weeks rehearsing and improvising little scenes without seeing a script! The two actors recall how much it meant to them at the time to be starring in a film so early in their careers. Fisk talks about how the characters affect the sets he designs and vice versa. This is an excellent look at how the film came together. There is an interview with producer Edward Pressman. Influences by the French New Wave, he wanted to work with filmmakers interested in making artistic endeavors and found it with Malick. He talks about the challenges of funding Badlands and how much he learned from the experience so early in his career. Also included is an interview with editor Billy Weber. He touches upon Malick’s working methods and the challenge of editing the film because of his inexperience at the time. He claims that the use of voiceover in Francois Truffaut’s The Wild Child (1970) influenced Malick’s use of it in Badlands. There is a 1993 episode of the television series American Justice that focused on Charles Starkweather, a teen rebel who ran off with his girlfriend for nine days and killed ten people during that time. This extra provides a nice overview of the people that inspired the main characters in Badlands.